﻿ Gerritt Rietveld -Designers & Designing - Design & Technology On The Web support resource for students and teachers of Design & Technology at KS3, KS4, A-Level and beyond. 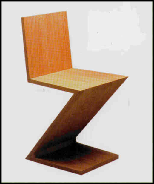 Rietveld was on of the first members of the ‘D-Stijl’ movement and exhibited his early chair designs at the Bauhaus in 1923. He also created architectural designs and his Schroder-Schrader house has the similar geometric characteristics of his interior designs. (1924). The ‘Schroder table’ was a design for use within the house.